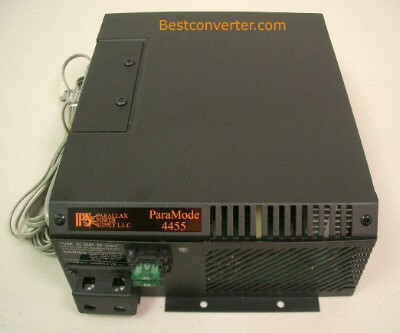 Multistage 55 Amp Parallax ParaMode Converter/Charger with Temperature Compensation. 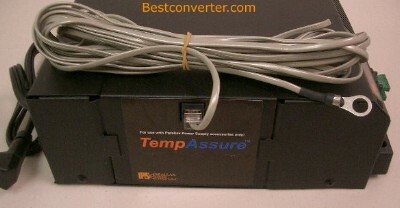 The ParaMode with TempAssure is an unprecedented breakthrough in the RV converter market. The cabled sensor can be connected directly to the battery post for ideal charge voltages based on actual temperature. Also includes integrated temperature controlled cooling fan. The ParaMode nominal output is 13.6 VDC. When first powered on, or when power is interrupted for at least one minute, the ParaMode will increase it's output voltage approximately .5 volts for 4 hours. If equipped with TempAssure the voltage during bulk will vary with with temperature and is capped at 14.4 VDC. After the bulk cycle, voltage output will drop back to the nominal output to finish charging (If required) and will continue to vary the voltage output based on temperature. Minimum voltage during extreme hot conditions is 12.8. 12.8 VDC has been chosen as a minimum voltage cap to help differentiate between battery voltage and DC accessories that might be powered at the same time.